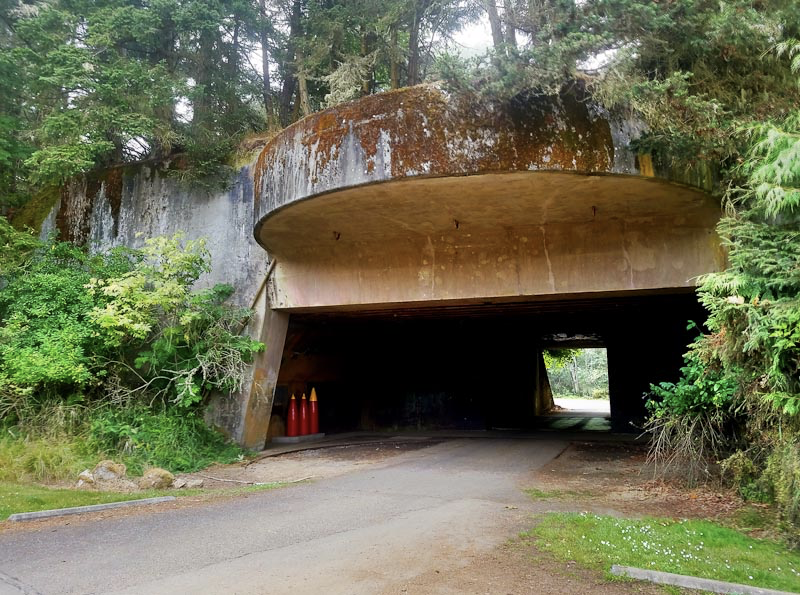 During August 6-20 the road and “likely” the trail will be closed for a culvert replacement. The closure extends from Louis Thompson Rd NE at the north to 212th Way SE at the south. There will be a signed detour on Louis Thompson Rd, 212th Ave, and 212th Way. However, judging from Street View images, this will be an unpleasant and dangerous bicycle route. Louis Thompson Rd and 212th Way climb steeply with narrow or no shoulders. 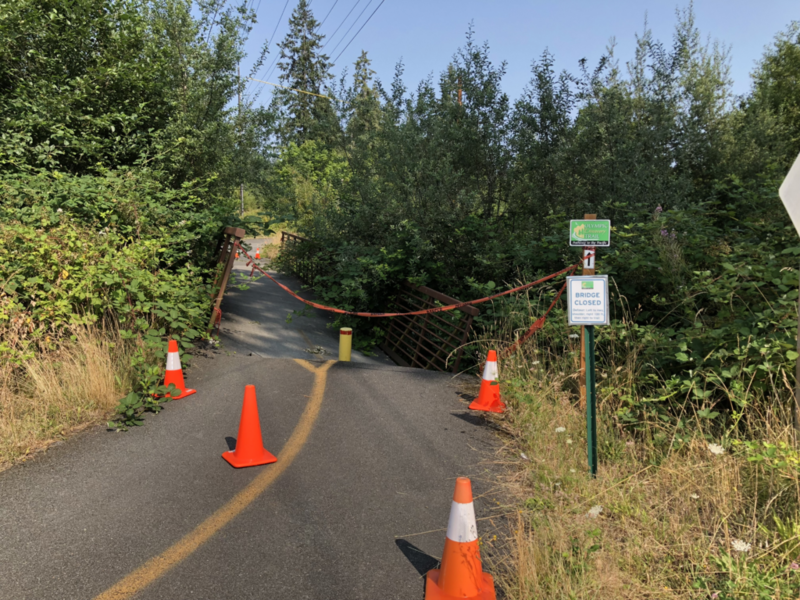 A safer bicycle detour should be NE Inglewood Hill Rd, 228 Ave NE, and SE 43rd Way. This route has adequate shoulders or bicycle lanes the whole way. This detour has about 660 ft of climbing vs 170 ft on the road. The detour adds about 5 km vs the road. Affected routes (not guaranteed comprehensive, courtesy of Yogy Namara):52, 359, 401, 531, 541, 605, 757, 758, 838, 1004, 1005, 1305, 1315, 1321, 1322, 1449, 1511, 1514, 1515, 1516, 1522, 1704, 1755, 1756, 2173, 2174, 2176, 2292, 2432, 2525, 2575, 2576, 2795, 3022, 3081, 3159, 3226, 3227, 3502, 3539, 3591. 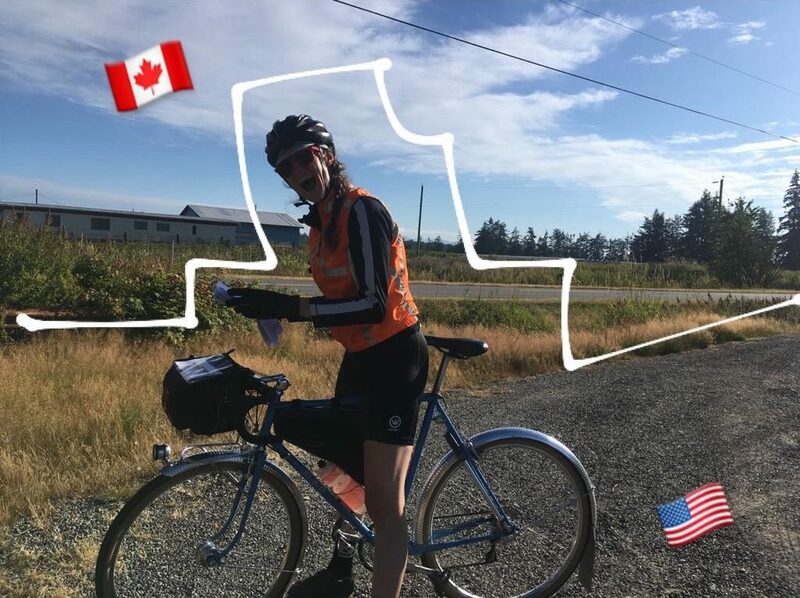 On Friday morning, in the chill air of the South Sound, we started our ride to the Canada border by heading south east. That felt a bit confusing, but the first control is in Rainier and, from there, the route backtracks along the Seattle-to-Portland route into Seattle. While this routing isn’t as scenic as sticking to the edge of the sound through Tacoma and Des Moines, it sure avoids a lot of climbing. And, despite what the cumulative elevation of 6713 m might suggest, avoiding big climbs was a goal for this route. Beginning in Sumner, you’ll be on the Interurban trail. During the pre-ride, some sections were closed for a repaving project that should be completed in time for the ride. We were able to make it through with only minimal swerving around “Trail Closed” signs and riding through gravel. You’ll also want to watch out for railroad tracks along the trail – some were barely noticeable, but others were quite bumpy. 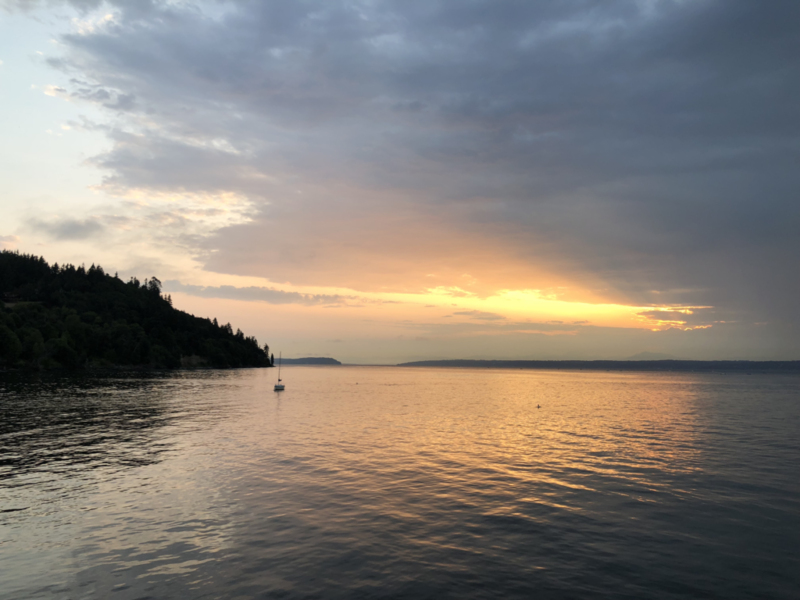 The Interurban trail drops you off in Renton, where you’ll find your way to the coast of Lake Washington for 40 km of watery views. Along this section, we stopped in Seward park to refill our water bottles, have a snack, and admire the lake with its variety of boats. 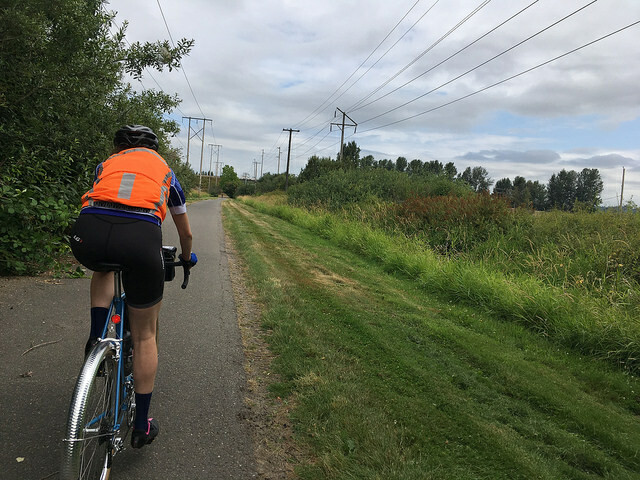 After the lakeside riding, the route features a section of the Burke-Gilman and Lake Sammamish Trails. Even on a weekday afternoon, these are popular trails, so be attentive to other cyclists and pedestrians who may be moving more slowly. 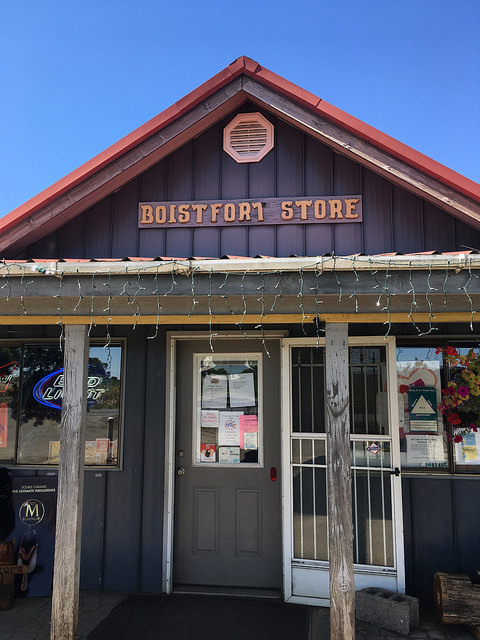 Things get steep for a while through Woodinville and Maltby before descending into Snohomish County where broad plains offer bucolic views framed by the Cascade Mountains to the east. 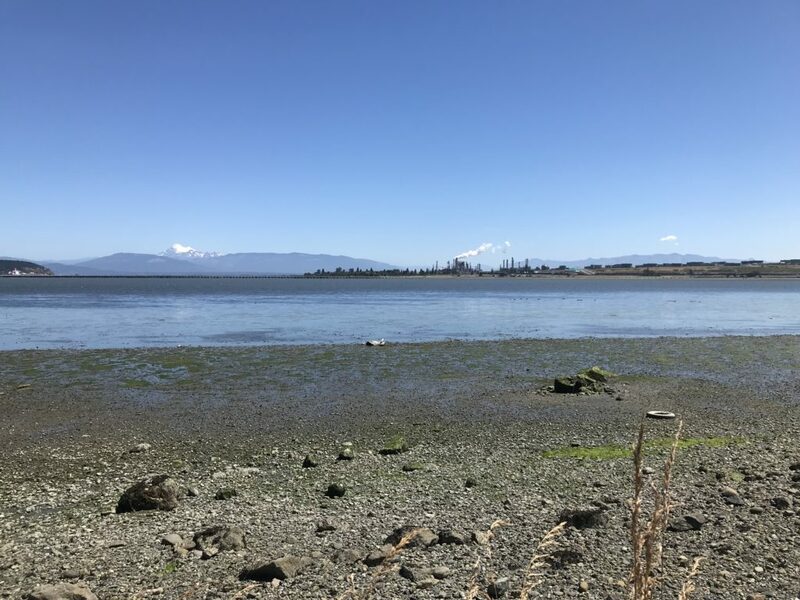 Marysville offers up some traffic and one of the route’s less pleasant roads, but the rolling hills from Tulalip Bay to Warm Beach are a great payoff. 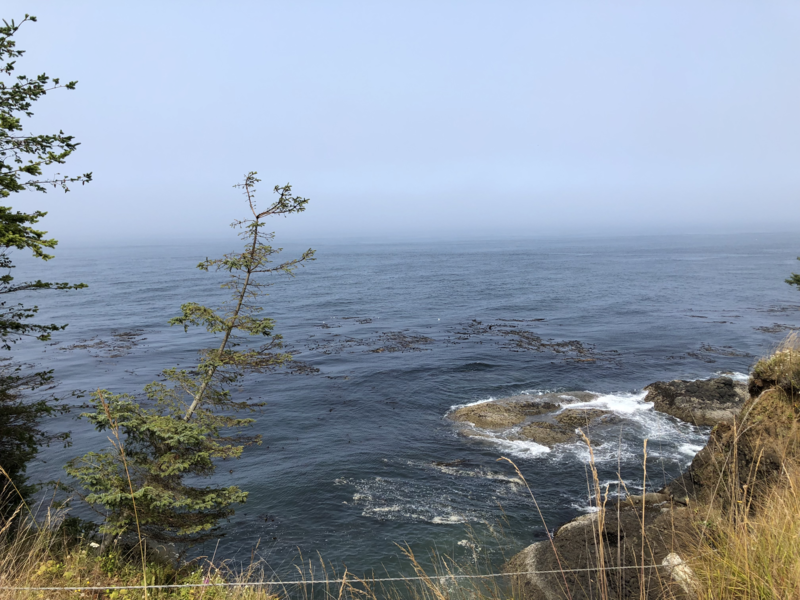 Due to a road closure just north of Warm Beach, you’ll trek back inland to Silvana before heading up through Stanwood and Conway to the Skagit Valley; however, the detour has a nice curvy descent into lovely farmland. Come back in the spring time for a wonderful display of Tulips in this area! If you catch Bayview State park before 8 pm, there are bathrooms and nice views across Padilla Bay to Anacortes and Gumes Island. 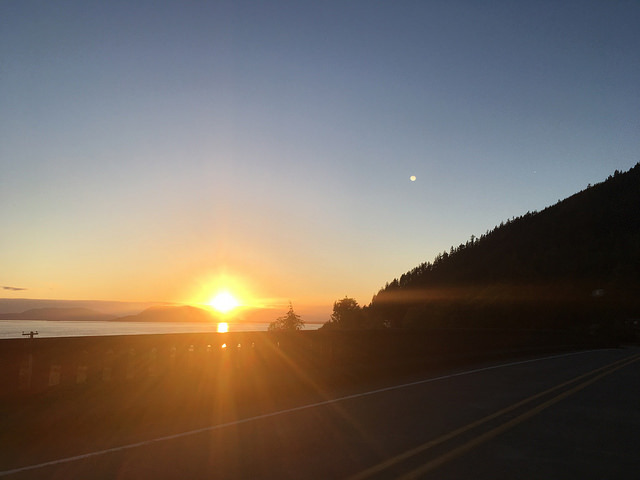 Chuckanut Drive, to the north, is a highlight of the route. Yes, it’s climby, but it sticks you right on the edge of Samish and Bellingham Bays where you can watch the sun set behind Lummi Island. 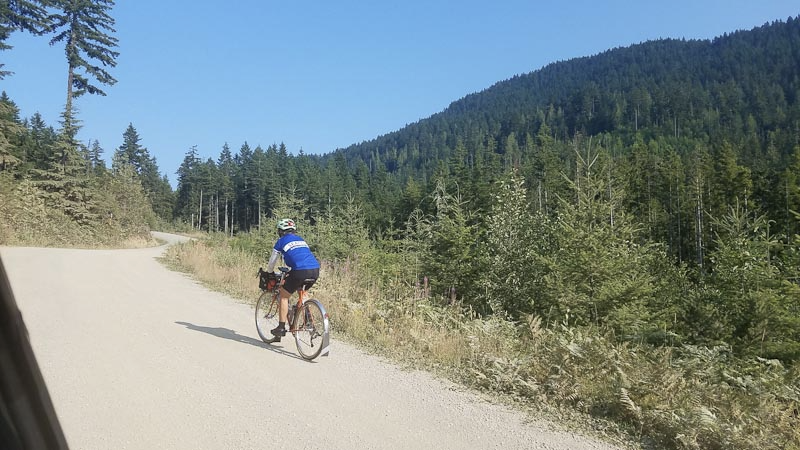 Anyway, the route from Fairhaven to Bellingham features a nice gravel trail that is totally rideable on a road bike with narrow tires. But if you can’t stand that kind of thing, feel free to stay on State Street into town. Keep in mind that Bellingham is a college town: Friday night downtown can be a bit of a party. We didn’t have any trouble, but you should keep both eyes open for young, dumb drivers and bar-hopping pedestrians. If you’re fast, you might pass through Lynden in time for services, otherwise plan on packing what you need before leaving Bellingham. On the pre-ride, we had some trouble with a dog within 5 km of the border, but he’s likely to be locked up in his kennel at night. We just had the bad luck to come by as his people were opening his kennel and the gate! They came out to the street with his leash and treats and we squirted him with our water bottles until he finally went home. If you meet Duke, squirt him right in his face for us. Thanks! He hates that. At the overnight control in Bellingham, we’ll have your drop-bags (if you choose to leave one at the start) and beds, but little else. For the pre-ride, we fit a change of clothes for day 2 in our bags. There’s a 24-hour Denny’s in the same parking lot where you can get dinner and breakfast regardless of your timing. We slept for 5 hours at this control. That was restful, but probably too much time by 1 or 2 hours; we were behind the clock all day Saturday. 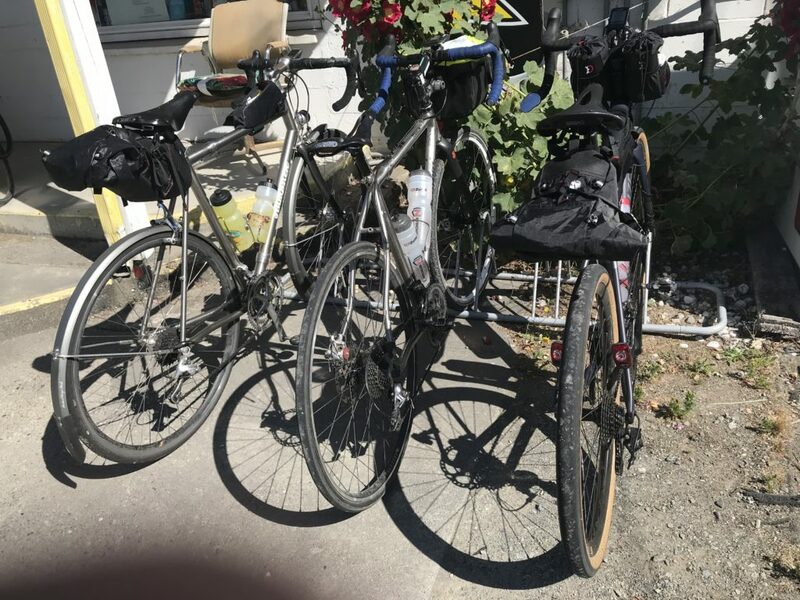 The route leaves Bellingham without passing many services, so be sure you have what you’ll need as there’s really very little over the next 50 km. 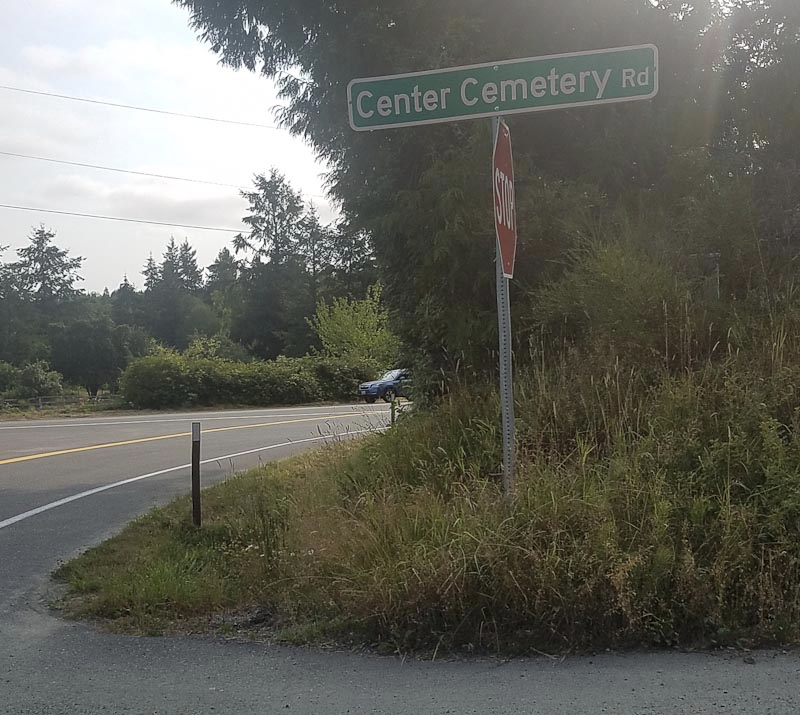 There are some steep climbs to get out of town and wake you up, but the bright side is that they aren’t long, and they lead into a lovely descent on a quiet road along Lake Samish, followed by the similarly nice Old Highway 99. We had to avoid a road closure near turning off Old 99 (don’t let the signs scare you up Bow Hill Road! The route uses a much shorter, flatter detour) and headed into Burlington, which was terrible. Lucky for you, the route now skips Burlington and goes into downtown Mount Vernon. 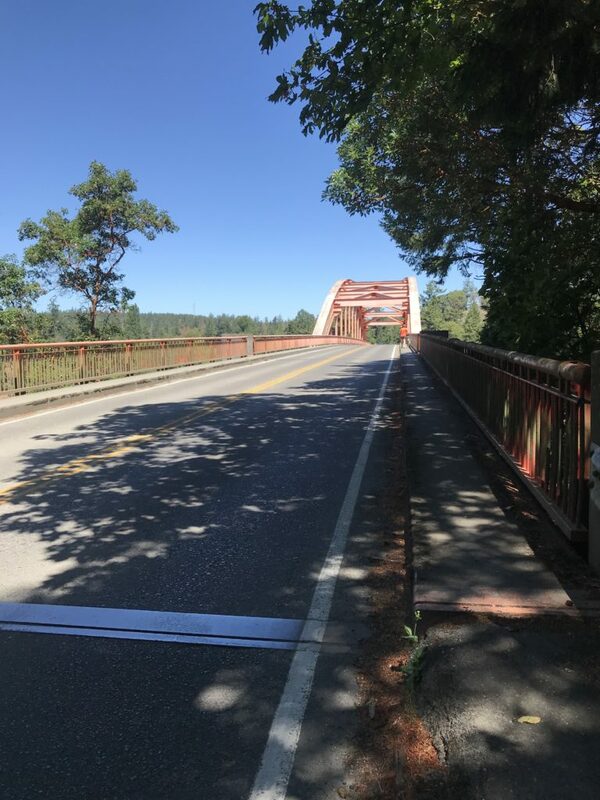 There is one section where you’ll have to rejoin main-road traffic to cross the Skagit River, but there is a bike lane on the bridge. In Mount Vernon, the Skagit Valley Co-op has everything, but we enjoyed a leisurely stop at the Calico Cupboard Café and Bakery. It’s an open control, so feel free to stop wherever you like to get your card signed. 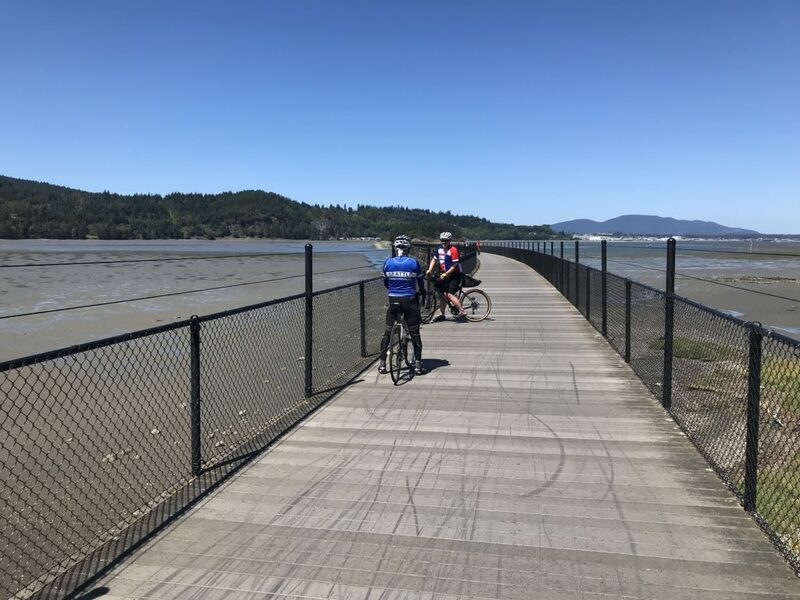 You’ll stick to frontage roads along I-5 returning nearly to Conway before heading east to Lake McMurray and the Centennial Trail. The trail is a popular place for slow cyclists and pedestrians, so please be cautious and attentive. You can keep a decent pace nonetheless, just ring your bell and pass with plenty of space. The Centennial Trail brings you back in Snohomish where you controlled on day 1. But leaving town you’ll head south east into the Snoqualmie River Valley to Carnation. This section offers mostly shaded, rolling roads with views of the Cascades and picturesque farms. Resupply in Carnation before the hill out of Fall City; there are a couple cafes in town, plus the grocery store where we went. As Rachel said on the pre-ride, that hill is no joke. Descending from the Issaquah Highlands you can pick up some good speed (we were going 40+ mph on our single bikes). Just be sure to get over to the left lane and avoid joining the freeway onramps! 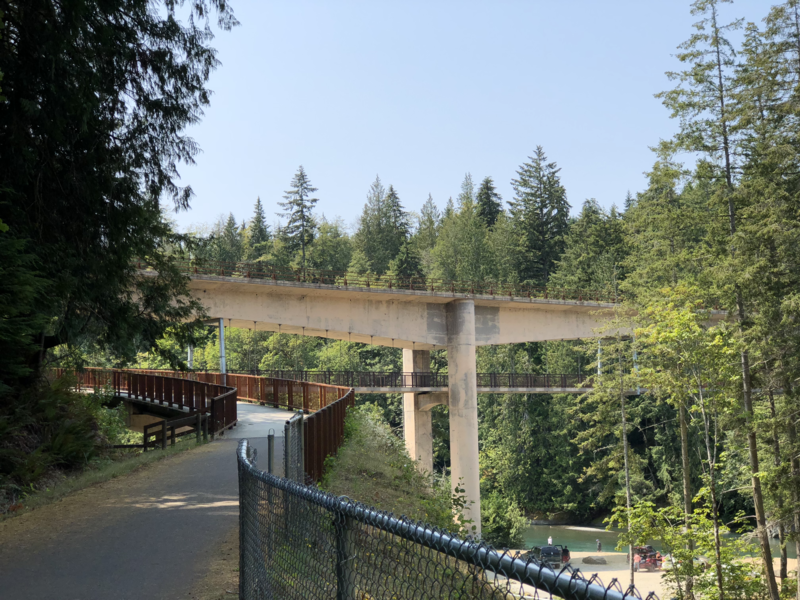 Control in Issaquah and then head out for more climbing: the highest elevation section of the route begins just as you leave Issaquah and ends 50 km later with a lovely descent into Orting on the Foothills trail. There was some road construction on the bridge between Enumclaw and Buckley which narrowed things down to one lane and stopped traffic in alternate directions. This seemed like a bad thing, but it resulted in making the left turn from 410 to Park Ave much easier than usual – there was only traffic coming from one direction by the time we finished the climb up from the bridge! 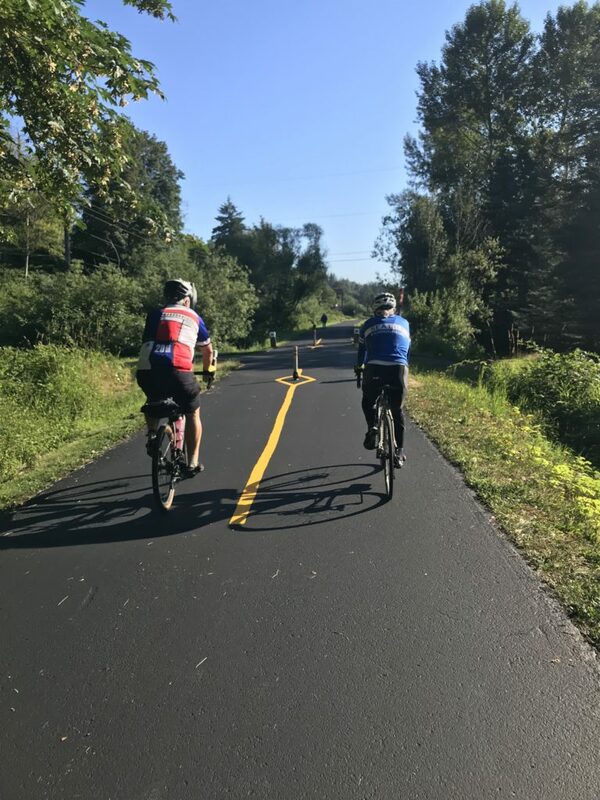 From Orting, you’ll climb a steep ridge and work your way back to familiar roads: 507 to Yelm, the Yelm-Tenino trail to Rainier and Rainier Road back into Tumwater. We got here very late on the pre-ride and it was cold and slow going. Bring your layers for night riding! After chasing the clock all day and riding extra distance to Eatonville (no longer on the route! ), we arrived in Tumwater at 5:00 am. We slept ~3 hours (I really didn’t want to tackle day 3 on any less) and started Sunday behind the clock again. Fortunately, the clock slows down this far into a ride and we started picking up a buffer with each control. For the pre-ride, day 3 was forecasted to be the hottest, as it is for the event. We started relatively late in the day (9:40 a.m.) and thus missed out on the typically cool morning hours. Instead, we hit the beginning of the heat with a high temperature reportedly about 93°F. According to our cycling computers it was 105°F. Considering that official air temperatures are measured at a height of 2 meters above ground, while you’ll be riding just above the hot asphalt, it’s going to feel much more like 100°F than 90°F. And there’s less shade than you’d expect. That said, we had a strong tailwind for most of the morning and early afternoon. Curtis Hill Road will probably have you cursing us (blame Ian! ), but the descent is fantastic and the roads on either side of the Boistfort Store are beautiful. You’ll get patches of shade here (though Rachel pointed out that all the climbs were sunny) and on the Westside Highway where the route heads south along the Cowlitz River to Longview. Longview has some big terrible roads, so we won’t go all the way to the Columbia river where the border is drawn between Oregon and Washington, but you’re very close. Instead, we’ll stick to lower traffic toads and then cross the Cowlitz into Kelso to join frontage roads along I5 where you’ll head north on the final leg of the journey. These frontage roads were shady and rolling – quite nice to ride! At the control in Toledo there’s a public bathroom at the boat launch just left after crossing the bridge into town. There’s also an IGA market (grocery store) open until 9 p.m. (they locked the door precisely on the hour!). The info control is at a gas station convenience store that’s open until 10 p.m. If you don’t want to stop, read the question in advance: you should be able to find the answer from your bike and remember it to write down later. Jackson Highway featured, for us, a beautiful sunset. If you’re earlier you’ll probably get great views of the valley, Mt St Helens, and Mt Rainier (we could just see both in the fading light). 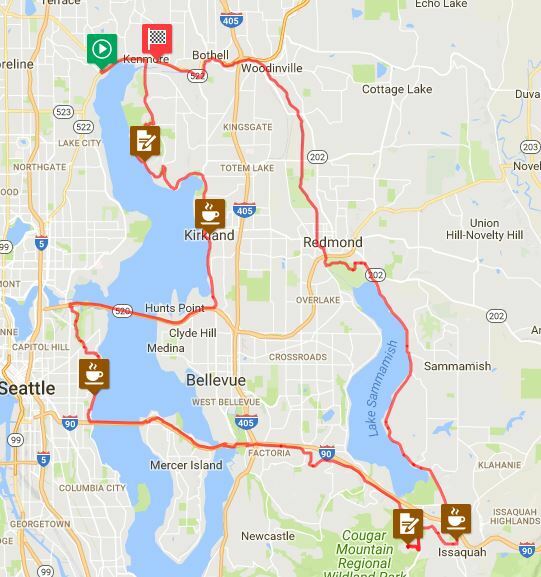 You’ll also get the last big climb through Lewis and Clark State Park at 939 km. But this means plenty of good descending into Chehalis and Centralia. Then you’ll go on through the valley with a few rollers to Bucoda and Tenino. Another info control at a gas station will leave your card with just one more slot to fill! Climb the last of the climbs out of town and (mostly) descend back to Tumwater. Of course, you can never believe “it’s all downhill from here,” but in this case, it mostly is. We rolled into the finish at 1:30 a.m. for 68 hours elapsed (the pre-ride started 30 minutes later than the brevet will start. Also note that we rode 1032.9 km and your route will be 1007 km). Then we enjoyed a celebratory beer, a well-earned shower, and bed! Strava users can look at our ride recording here: https://www.strava.com/activities/1721889143 (if you don’t log in, only high-level details are visible). For this summer’s populaire, start with a coffee, end with a beer, and avail yourself of bakeries along the way. The ride starts at 9:00 AM on July 14th from Starbucks Lake Forest Park. We will be opening registration at 8:30. To simplify the process for yourself and the organizers on Saturday, please preregister. It looks like this is going to be one of the rare events where both the pre-riders and the day of riders get excellent weather. 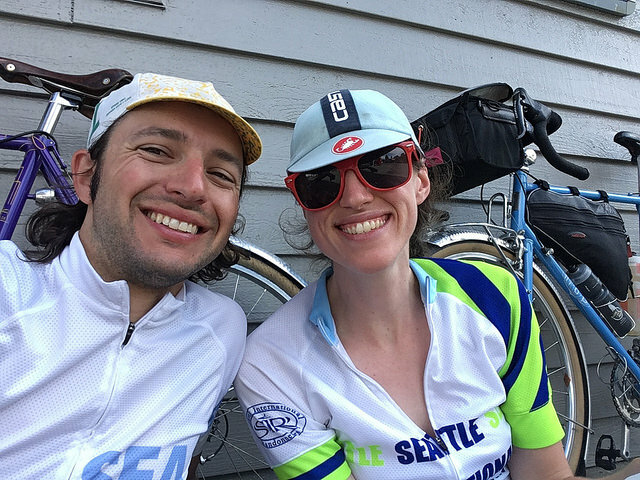 This is great because, in addition to passing by coffee shops, bakeries, and breweries, we spend a fair amount of time next to Lake Washington — riders will get to enjoy the views. Although there is not a ton of climbing, this is not a fast course as there is a fair amount of trail riding. There were lots of children, dogs, and people not paying attention on the trail during the pre-ride. Please be careful. Keep your speed down and break into smaller groups. The climb up to the control at the coffee shop is steep but only ½ mile long. 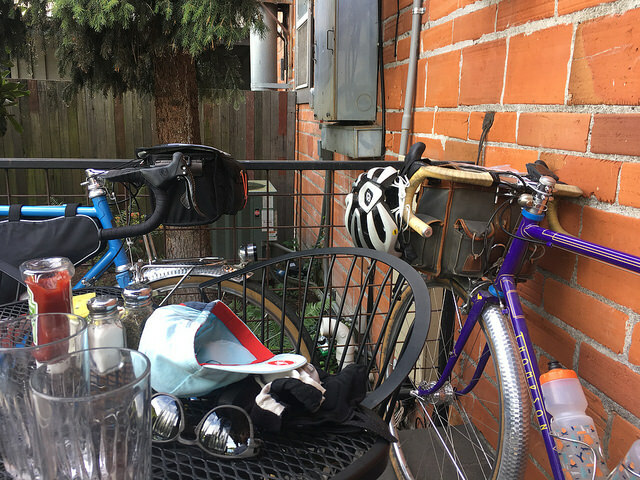 So, as you are cursing the ride organizer, remember that you’ll have finished 90% of the climbing once you get to the coffee shop. There are lots of street fairs and festivals scheduled along the course. 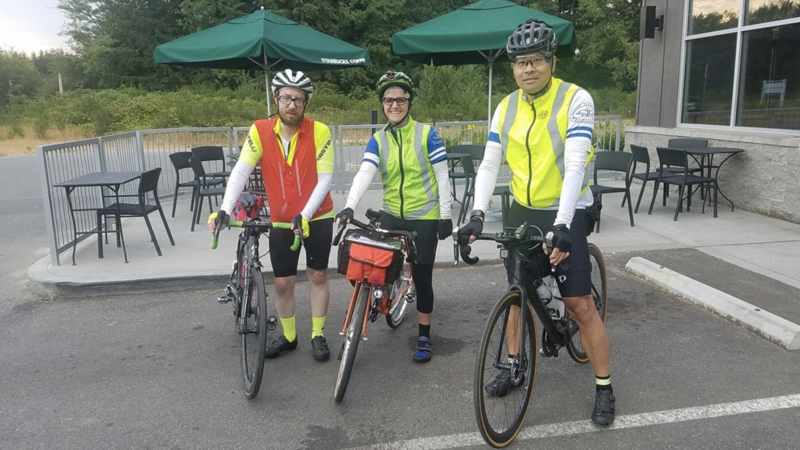 We saw signs for events in Kirkland, Mercer Island and Redmond scheduled for the same day as the ride. More information available on the SIR website.